A voltage converter set that does all the work for you. This combination transformer/converter steps down foreign electricity (220/240V) to North American (110/125V) current. It detects electric or electronic appliance and switches automatically between a 0-50 Watt transformer and a 51-1875 watt converter. For use with battery chargers, curling irons, shavers, toothbrushes, and other electronic or electric appliances between 0-50 Watts, and for use with hair dryers, clothes steamers, irons, heating pads, coffee makers, beverage heaters, and other electric appliances between 51-1875 Watts. Comes with a durable nylon zipped pouch. You cannot use a voltage converter without an adapter plug! Even though the voltage converters have 2 rounded pins (as used in most of Europe) the outlets are recessed and an adapter plug is still necessary. If your appliance is dual or multi voltage, you do not need a voltage converter, only an adapter plug. This combination transformer/converter steps down foreign electricity (220/240V) to North American (110/125V) current. DO NOT USE YOUR COMPUTER WITH ANY EAGLE CREEK TRANSFORMER OR CONVERTER! Adapter Plugs by themselves DO NOT convert Electricity! The full manufacturer's warranty from Eagle Creek is only valid when the Eagle Creek Auto Dual Wattage International Converter Set is purchased from an Internet Authorized Dealer. We will match any Internet Authorized Dealer's best price on the Eagle Creek Auto Dual Wattage International Converter Set. 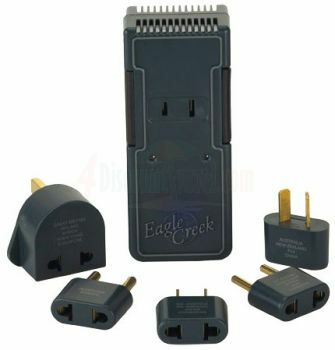 The Eagle Creek Auto Dual Wattage International Converter Set may be referred to by the following terms: 4041712.